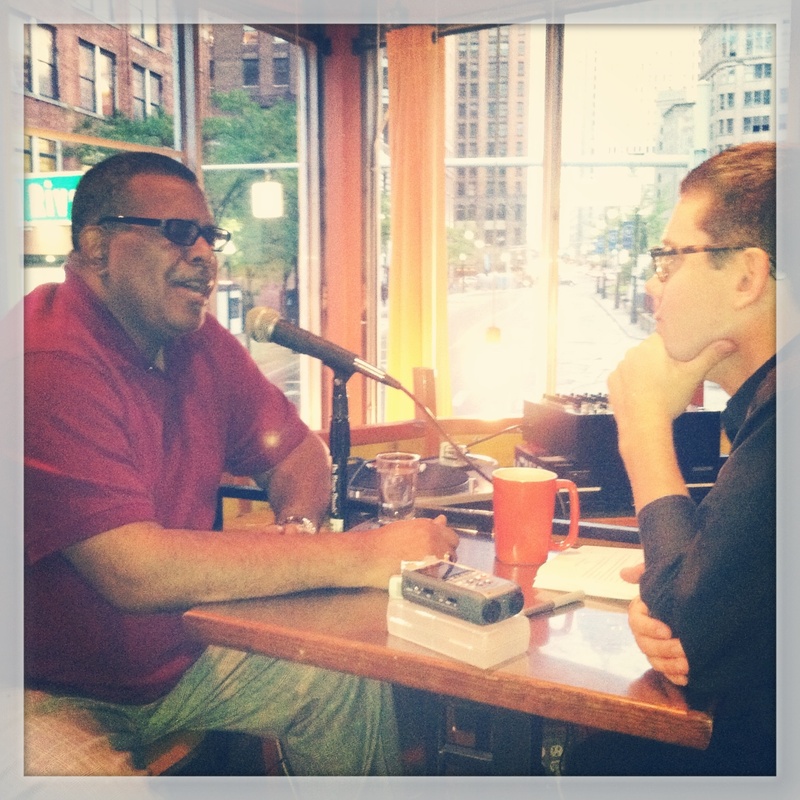 Interviewer (Carleton Gholz): Welcome to the Detroit Sound Conservancy first-ever Record night at Urban Bean. [applause] [laughs] Fantastic. My name is Carleton Gholz and I’m the executive director and founder of the Detroit Sound Conservancy. We are two years old, and we now have merch, if you go online and, uh, order t-shirts. That’s how old we are. Tonight we are with our first-ever interview at Record, and we digitized a tape recently that this person brought to us and we’ve been playing it for the last hour here at the shop on Urban Bean at Grand River and Griswold in downtown Detroit. This is the Capital Park neighborhood of Detroit. Have I said everything right so far? I: Good. Excellent. I am with Greg Collier, and we’ve got sort of five questions here or so for Mr. Collier, and Greg, could you briefly describe who you are, and your relationship to Detroit music? Participant (Greg Collier): Uh, my name is Greg Collier, and I’m probably better known as being Ken Collier’s baby brother. Better known as being Ken Collier’s baby brother, but I’m Greg Collier. I’m also a D.J., DJ’d in the city of Detroit from 1980 through 2004, but prior to that was DJing in Chicago, so I’ve been in the business for a long time. And, um, that’s pretty much my relationship to… I got the, what was the first part? P: Oh, my relationship to Detroit music? I just love music, period. Detroit, I love all music. And so, I guess I’ve contributed to Detroit music through what we’ve done in our music and in the club scenes, particularly in the underground club scenes in the early days, here in Detroit. I: Well, we’ll stick to our script here, and we can go off later. What was the first Detroit record you remember hearing: what was it, how’d you hear it, and what’d you think? Your first Detroit record, and if you’d get real closer [sic] to the mic. There you go. P: That’s a hard one because I don’t know exactly what you mean by “Detroit record”, so I’ll just say with me, music was in my house for as far back as I can remember. With my parents, we always had music in our home. Probably some of my early first records that I can remember are old Sam Cooke, um, what’s her name, Etta James. P: Uh, early days of the blues that my Mom and Dad used to listen to a lot. Ray Charles. Those are some of the early music in the early days I heard, and things I heard. And of course, I grew up in Motown and in the Motown era. When you say Detroit music, it’s kind of hard for me to describe that, because music was music for us then. I grew up in a time when there were so many firsts. Like, when you just saw, when The Supremes and The Temptations first made it on television, that was an event in Detroit, because everybody wanted to see that so we all made sure we were around the television to see it. And I was there to see those things. So, that’s pretty much me. I’ve been involved in music all my life. I: Do, do you — just a quick follow-up — If I may, a quick follow-up would be: do you remember, though, owning a first record of your own as opposed to something your parents would have had, that your parents were listening to. Something that you had either paid [for] with your own money, necessarily, that you got as a gift, something–a record that yours. I: [laughs] Stevie… On 45? I: Parts one and two. P: Yep. [both laughing] That was my first record. I: And what do you remember in that record in particular? P: And then, the first one that I bought and I got bought the first album, was Marvin Gaye and Tammi Terrell. I: On 45 or the full LP? I: We have a nice audience in the crowd here who knows the album cover well. Um, Motown is known the world over, as you’ve already pointed out… Just describe one aspect of Detroit music history that you wished got more attention when you hear about Detroit music history. P: You know, probably when I hear about Detroit music history… I hear stories and I’ve heard a little bit about it, but the days of the old Black Bottom. The jazz days of when the early jazz, when the early, back in… I don’t know how far back it goes but when the clubs that were owned, back in over on the east side when it was an area called Black Bottom and there was a lot of black-owned businesses and black clubs. And black music was very prevalent in those eras. But a lot of that is not talked about or you don’t hear much about it. As much as you hear… you hear a lot about Motown, but you don’t hear about that. Also, we focus so much on Motown but Detroit has a great jazz history. I: What would you put in that, [in] particular? Anything or artists that you would listen to? Like in Detroit, like… did you go out and listen to jazz, or? P: I used to listen to a lot of jazz. I used to listen to Grant Green. That was probably one of my favorite great jazz artists, back in the day. Used to go to Baker’s Keyboard Lounge; I had been there. There was a club back in the early days, over on Fenkell called Watt’s Club Mozambique. P: Attended there a lot, but those were back in the early days. So there were clubs that I had been to that I heard jazz. But back in the day… but, the Black Bottom stuff, I never really got a chance to hear or experience a lot of that. But you heard a lot about it. My parents used to talk to me about some, some of the days of the old Black Bottom. So I just wished that we could know a little bit more about that. I: What do you think we lose, or gain, I guess the answer to the question could be, what do you think we lose or gain if we do not preserve Detroit’s musical history? What do you think we lose if we don’t, if we don’t do that? P: I think it’s in anything else, we lose a lot of our heritage and we lose our history. The music that is grown here and has been created here, all the way from the Motown and from prior to that, all the way up to the new things that are being done now. You must preserve it… for those who’s coming along. Particularly when you have people that are learning music and studying music. They need to know the music that came before them so they can study and know what they’ve listened to. I always believed that you can’t go on without knowing where you’ve been. And everything about it. P: [laughing] Oh, you found it! I: The album was “Satisfied Feeling” by Tammi Terrell and Marvin Gaye. And what year was that? (Audience): [unclear] Oh, shoot, I don’t know. I: Well, we’ll figure it out. P: Around… around ’67 or ’68. I: So the next couple of questions have to do… I’m gonna just skip to the questions that are about the tape we were listening to from Todd’s, which was a club on the… East Side, and the tape is from New Year’s Eve 1986. And I just wanted to ask you a little bit about, if you could just describe for anybody who’s never been there or never was there, I should say, describe Todd’s, how did you come to play there, what was the music like, what was the audience like, you know… anything you’d like to say about Todd’s. P: Well, Todd’s was a… unique club, it been around before even I started there back in the disco days. It was a former bowling alley. And they knocked out all the lanes and they turned the bowling alley side into a dance floor. So it had one of the largest dance floors. It also had one of the best sound systems in the city that I had heard. And, it… when I got there, it had a, a unique crowd. All the crowd was predominantly black, African-American, gay. It also had a cross-section of a little bit of everybody. Mainly because of the type of music that was being played there. We brought dance music to a different level. Bringing in the sounds of Chicago, New York, Philadelphia, and bringing all of that into Detroit, and just brought a blend of music that wasn’t being played a lot in a lot of other clubs. [laughing] So. I: And how did you come to play there? How did you arrive at Todd’s? P: Uh, well… luck. And being in the right place at the right time. I: Okay! [laughing] [unintelligible] Why did you record yourself? You have this tape, and we have some other tapes. Uh, well, you were, well, we estimated that you had about sixty tapes, what we were talking about. So, why did you record yourself? P: I always tried to be a little bit of a perfectionist, and so I had to criticize my own work. Every night I would record my own work just to see what I could do. And when I’d leave the club I’d play it back so I could critique my own self. Hear things I did that I liked, what things I didn’t like, what things I played that I shouldn’t play, things that… and that sort of thing. So it became more of a study guide for me. It was a way of reviewing my work. And then of course, as the people started enjoying the music more, the following week, I would always sell the tapes from the previous week. P: [laughing] Oh, there’s several of those floating around. I: He was at other clubs and other places. Just for, again, for some people who weren’t there, who don’t remember, and who just don’t know about him and his place in music, what would you want to say about your brother and his music? P: Oh, I think… Ken was one of a group of DJs that really opened the door to the whole thing. Not until the mid 70’s, no one had ever taken two turntables at a mixer, and had blended music completely where music was continuous and never stopped. Until my brother started doing it here, in clubs like Studio 54 and the Chess Mate where he was working at, where this was just nonstop. And this was back in the ’70s back in the disco era. He brought that sound to Detroit. He also had a radio show back in the ’70s. That started… that, to me, in my opinion, kind of is the birth of the whole music-club-underground-dance revolution. It all started with those two turntables and a mixer. Because until	somebody started mixing it, even when we started doing it in Chicago, everybody played one record, then they played another record, there was no mixing and continuous music. When we started doing that, it just opened up a whole different door. People, some people gravitated to it immediately, some people rejected it, and then took it off… Immediately, later on got to it, now instead of some point where if you don’t know how to mix, you just can’t. You can’t spin. But those doors opened back in the ’70s. Here in Detroit, I think Ken really opened the doors for a lot of people. And Ken really was also a very big-hearted person. Also Ken used to let everybody play. I used to tease my brother, I used to say, “You are the laziest, richest DJ I’ve ever seen, ’cause you go and sit and everybody else be playin’, and at the end of the night, you get paid!” [laughs] But that’s how, that’s the type of DJ Ken was. He opened up his heart and his turntables and would let everybody come in there and play at his clubs when he played. He gave everybody an opportunity. And I think that’s something that he should always be remembered as. I know there are many DJs here in Detroit who thank Ken for giving them their start. I: I know it’s not on the list, but it’s related to that question, and you don’t have to answer it if you don’t want to, but seeing since we saw each other, you know, earlier in the summer and some other times, Frankie Knuckles passed away too, and Frankie was very important as well, I just didn’t know if you wanted to say something about Frankie and his influence on you, and in Chicago, if you wanted to say something about that. P: I met Frankie back in the early, back in the mid-’70s when Frankie first came to Chicago. And Frankie… guided me and taught me basically how to mix and how to play. And our friendship that we had back in those days when I lived in Chicago, we were very close back in those days. That is a time that I will always cherish and I’ll never forget. He and I had a very close friendship in the early, in the middle ’70s, up until the time that I left Chicago and we stayed in contact with each other all the way up through the years. We didn’t remain as close of friends as we probably should have, maybe difference of opinions, because we each chose our own paths that we drove, went down. But I’ll always cherish those times, back in the ’70s that I spent with Frankie. And I, I owe probably everything that I learned, as far as playing, from him. He opened up a lot of doors for me. So. I: We’re getting down to the end of the questions, maybe one more question about what, what one record, you know obviously I can’t ask Ken this question, what was the first record that you remember hearing? I can’t ask him that. Is there a particular song, or early song that you know that he liked a lot when he was younger? Something that he might have been able to answer that question, something that, what he really liked when he was younger? I: I can’t have him answer that one I’m afraid. I: Like from the store. P: Yeah. I, I know he liked Billy Paul a lot, “Me and Mrs. Jones.” “Me and Mrs. Jones”, he liked that, that was a favorite of his. That whole Philly International sound back then was very prevalent back in the early ’70s. He and I both loved a lot of that. So. I: And the last question for the evening. Because we’re young, the Sound Conservancy is young, give us some advice, Mr. Collier: what should the DSC be concentrating on in the coming years? What should we be doing? P: I, I think you’re already doing it. You’re getting information, you’re gathering all different types of music and you’re preserving it for those that come behind, come behind, come after us so that they’ll have something to go back to, and can look on, and can see the different types of music. And experience different things. So I think you’re on the right track, I think you’re doing everything right. P: Seven and Van… Van Dyke and Seven Mile. I: Van Dyke and Seven Mile. Todd’s. 1986. P: It’s a grocery store. Just pass by the grocery store. I: [all laughing] This is the Detroit Sound Conservancy. Notes:# Transcribed by Kayla Anne MacLennan (maclkayl@gmail.com) on 17 Jan 2015. Kayla is a Master's student at the University of Michigan School of Information, where she studies information analysis and human-computer interaction. Cite As:Greg Collier, interview by Carleton Gholz, digital audio recording, 27 October 2014.